PortalProdigy makes it easy to create an attractive and professional looking Home Page that promotes your products and services and directs visitors to what they are looking for. PortalProdigy’s Home Page Builder makes it easy to implement changes and update your Home Page content. It also provides options to automatically feed content to your Home Page such as current Events, News, Products, Resources, etc. Your Home Page is fully integrated with the PortalProdigy’s system to provide visitors with a uniform branding experience and consistent site navigation. Allows you to customize your Home Page content and formatting. Supports Home Page design and branding that is consistent with other pages throughout your website. Easy to configure and make changes. Changes are automatically applied. Select from a variety of design templates. Templates provide standard layout and design style for your Home Page that is consistent with other pages throughout your Website. Supports fully customized Splash Page. 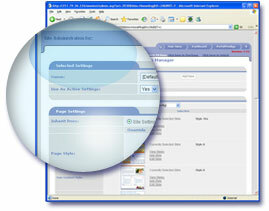 Individual elements within your Home Page are customizable using menu driven data entry pages. Changes are automatically applied. Features and content lookups make it easy to create links on your Home Page. Customize site branding. Load your logo, organization title, heading, copyright, and graphics to provide consistent branding throughout your site. Changes are automatically applied. Customize design elements for individual sections such as highlighted Events, News, Products, and Promotions using menu driven data entry screens. Include Product Search on your Home Page. Easy to upload images for display on your Home Page. Mini Browser Builder tool for creating customized Home Page sections. Automatically feed and display content on your Home Page including highlighted Events, News, Products, and Resources. Links to content detail pages are automatically inserted. Custom Home Page designs and graphics development are available upon request.